Vera Dietz has spent her entire life putting out "please ignore Vera Dietz" signals and wrestling with what she believes is her fate to end up exactly like her parents—an alcoholic stripper. When her best friend since childhood, Charlie Kahn, dies unexpectedly, Vera knows how to clear his name of the crime associated with his death, but she's stuck. Still mad at him for betraying her months earlier, she stays quiet, trying to deal with his death, her resentment towards him, and her own fate. Please Ignore Vera Dietz is a powerful, tragic, and surprisingly poignant book. The majority of the book is narrated by Vera, who is a real, flawed, and darkly humorous character with a voice that demands to be listened to. Her narrative alternates between the past and present, and every so often a chapter from the point of view of Charlie, Vera's father, or even the pagoda in their hometown shows up in surprisingly refreshing interludes. King provides an excellent balance between all of these points of view, and the different perspectives give this book another interesting layer as readers can see firsthand the troubles Vera's father faced in his life and the mistakes he doesn't want his daughter to repeat, and Charlie's own regrets. The issue of children “fated” to become their parents is dealt with well, and King realistically portrays the conflicts and temptations that Vera faces without sugarcoating anything. 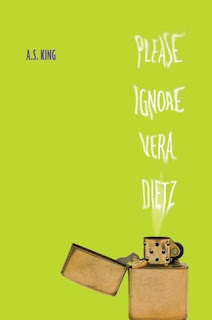 Please Ignore Vera Dietz is as much about Vera's struggle to forgive Charlie as it is about her reconciling her feelings about her mother's abandonment and finally opening up to her father. This is an unforgettable book about mistakes, second chances, redemption, and becoming your own person—please don't ignore Vera Dietz. Cover Comments: I like how unexpected this cover is, with the lighter and the bright green background. The way that the title is written is maybe a little hard to read, but very creative. Overall, I like it a lot! I've heard this book is amazing. Sounds like something I'd really enjoy! I really want to read this! Thanks for posting your review...It's awesome! WANT! Also, that first line on your post about this book? Brilliant. HAD to read more about this book after that. I'm really looking forward to read this one, it sounds fantastic!